Japanese game developer tri-Ace has teamed up with SEGA for a new, multi-platform role-playing game called End of Eternity. It was announced last week in game magazine Famitsu, and Famitsu.com has now posted screens as well. While these same screens ran in the magazine, blurry scans meant it was hard to get a closer look at the game. Set in futuristic towering megapolis Bazel, EoE's main characters are 17-year-old Private Military Firm (PMF) mercenary Zephyr, 26-year-old ex-solider Vashyron and 19-year-old young woman Test Subject No. 20. She's escaped from a research facility where she was housed. All this set against the background of Bazel, which acts as an environment purifier to cleanse the pollution surrounding the Earth. Basel is divided by class with the middle and wealthy classes living in the middle-to-upper echelons, and the lower classes living below. Each floor is broken up into a field of battle, where your party can be thrown into random encounters. When there is a random encounter with an enemy, the switch to battle mode is seamless. 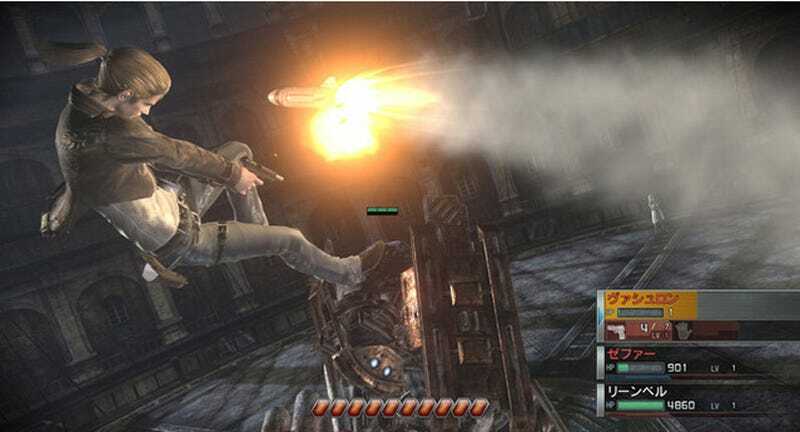 The game uses a third person point-of-view perspective for controlling the characters, and the battles are in semi-real time with the ability to switch to between other characters in your party. The game's a multi-platform title (Xbox 360 and PS3) and is slated for this winter. Check out the screens below.